Camping is one of the most popular of all family outdoor activities these days. For those who have ever had to pitch a tent, you know exactly how difficult and time-consuming a task it can be. This is where instant or pup tents, as they are commonly referred to, can be very useful. The instant tent is designed in a way that makes it possible to set one up in a matter of a couple of minutes. If you are searching for a 3, 4, 8, 10, 12 or 6 person tent then you are at right place. We have come up with our 8 best instant tents, and they are reviewed below. The CORE Equipment 12 Person Instant Cabin Tent is absolutely the largest of all of the tents on our Top 8 list. This humongous 18’ x 10’ cabin-style tent can be configured to fit up to 12 people, but it also can be divided into three separate areas with two removable dividers. 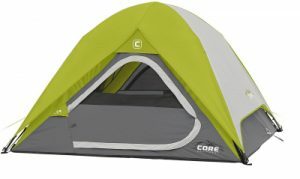 Thanks to Core’s unique instant pitch construction, you can have the tent pitched or taken down in about two minutes, leaving you plenty of time to enjoy the great outdoors. The highly flexible fiberglass poles are attached and, when in place, there is an amazing 6’ 8” center height, meaning that almost anyone can stand in the middle without hitting the roof. The entire panoramic top and window openings feature a mesh fabric that allows the breeze and light to shine through. The removable rainfly covers the entire top to keep the rain out in case of inclement weather. The CORE exclusive H2O Block system prevents water from seeping into the bottom of the tent and, using a combination of water bead technology and water resistant fabric, no water will get in and ruin your sleep during inclement weather. 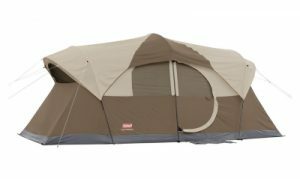 This huge, 12 person tent is perfect for a large family or group that is looking for a tent for an upcoming camping trip. Whether you are expecting perfect weather, or your camping area is hit by an unexpected storm, the CORE 12 Person Instant Cabin Tent – 18′ x 10′ is going to be able to handle it and keep you safe and dry inside. 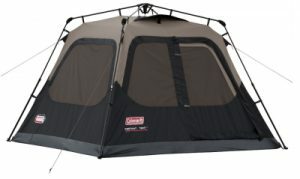 The Coleman WeatherMaster 10 Person Tent is the largest of all of the Coleman tents on our Top 8 list. This massive tent was designed to hold up to 10 people and can be set up quickly. The exterior fabric is made using a tear and water resistant Polyester Taffeta 75D 450mm PU coating. The Coleman’s exclusive Weathertec system combines water-resistant fabric, a welded floor, and inverted seams to prevent water from getting into the tent and ruining your night’s sleep during inclement weather. The roof of the tent is entirely mesh, which, when the weather is nice, will allow the light and breeze to come through. For those times when inclement weather is expected, the package includes a rainfly that covers the entire top of the tent. Along with numerous large windows that allow plenty of light through, there are two doors for entering and leaving the tent, including a unique hinged door for quick access. There is a removable room divider that will split the tent area in half and provides a bit of privacy. The ultra-high center height provides 6’ 8” of clearance, which gives you plenty of headroom. The Coleman WeatherMaster Tent is the largest of all of the Coleman tents on our list. 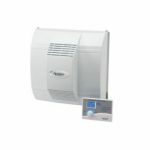 It was designed to provide plenty of protection from the elements while giving your party plenty of room to stretch out. The large area is big enough to fit up to three queen size air mattresses for extra comfort for everyone. The large windows and panoramic mesh roof give you plenty of airflow on those clear days. If you are looking for a best 10 person instant tent then you should consider this model. The Tenaya Lake 8 Person Fast Pitch Cabin Tent is like no other tent offered by any manufacturer in its class. This large, cabin-style tent can be separated into two areas and can fit two queen size air mattresses and accommodate 8 people. It also features something not available in any other tent: an attached closet with shelves and a clothes bar. The fast pitch mechanism built into the Tenaya Lake tent was designed to make it possible to pitch the whole tent within 9 minutes from the time you pull it out of the carry bag until it is ready to occupy. The flexible fiberglass poles are all color coded and pre-attached to make it easy to get it set up quickly. The exclusive Weathertec system developed by Coleman for all of their camping tents combines several technologies that help to prevent water from getting into the tent and ruining your good night’s sleep. The tent features a welded floor and inverted seams to prevent water from penetrating and getting into the tent. The walls are made from water and tear resistant polyester fabric. It includes a couple of additional features like a fast access hinged door and a protective rainfly that covers the entire top of the tent. It also includes a unique cord port that can be sealed when not in use. 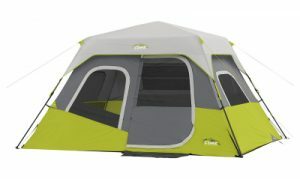 The Coleman Tenaya Instant Cabin Camping Tent is a unique 8-person tent that features a walk-in closet that is capable of holding quite a bit of personal stuff and keeps it well organized and off the floor of the tent. The fast pitch mechanism makes it possible to put the tent up in as little as 9 minutes and take it back down as quickly. 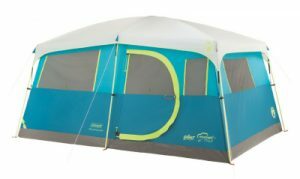 This is the perfect tent for most large families or groups that are planning an upcoming camping trip. 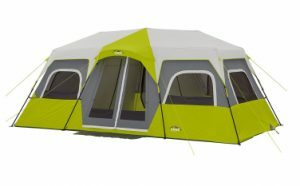 Coleman, the industry leader in the manufacturing of best outdoor gear, offers this huge, cabin-style instant tent that is designed to sleep up to 8 people. The floor is large enough to put two queen size air mattresses, and it has 7 large windows and two entrances. It can be pitched or taken down in a less than 60 seconds, allowing plenty of time to put it up and still enjoy your day. The instant tent fabric is made out of rip and water resistant 150D Polyester, and each of the windows and doors has a mesh covering to keep out the bugs while allowing for maximum ventilation. The interior is very spacious and it has an amazing 6’ 5” center height, which means almost anyone would be able to stand straight up at the center of the tent. For the times that you require privacy, you can leave the removable divider in place. The highly flexible fiberglass poles and tie down lines are pre-attached, and they snap in place in less than a minute; the included stakes help to hold it in place. With all the tie downs in place and the rain fly in place, the tent is able to withstand the wind and rain, and you and your family will stay completely safe and dry inside. The Coleman Weathertec system keeps the water from getting inside thanks to several exclusive technologies combined to provide several layers of protection. The Coleman 8 Person Instant Tent (10’ x 14’) is one of Coleman’s leading large-capacity tents. It can comfortably accommodate up to 8 people and keep them safe and dry under even some of the most dangerous environmental conditions. This tent is perfect for a family, large or small, and can be used under a wide range of weather conditions. This large, cabin-style instant tent from CORE Equipment features a good-size 11’ x 9’ footprint that is large enough to sleep up to 6 people and will accommodate two queen size air mattresses for extra comfort for everyone. It is constructed from extra durable fabric and extremely sturdy materials to help withstand any elements that could pop up. It is constructed of heavy duty, durable, rip resistant polyester fabric that will also resist water from penetrating the walls. It features an exclusive H20 Block technology from CORE Equipment, which includes a unique water resistant floor construction. It also includes a rainfly that completely covers the panoramic mesh ceiling, which can be left open during clear weather to allow for max ventilation. The high ceiling height (72” at the peak) makes it easy for an average person to stand up, and it also features a unique storage system with a hook for hanging a lantern. There is also a built-in power cord that extends through to the outside so that you can have power inside. The cord is completely sealed in when not in use or during inclement weather. This 6 Person Instant Cabin Tent (11′ x 9′) is perfect for a large family that enjoys camping. It was designed to be pitched in a matter of seconds and still be extremely sturdy and able to hold up to the elements. It can hold up to 6 people comfortably and features a 6-foot center height. The large mesh-lined windows give you an amazing view while keeping out all of the bugs. It is the perfect instant tent for your large family. Coleman is one of the most recognizable names in the outdoor industry. 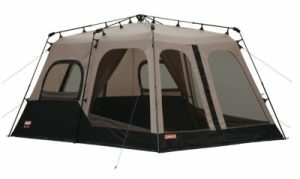 The Instant 4 Person Tent is one of many well-engineered and manufactured products from Coleman. The 8’ x 7’ floor is large enough to accommodate a queen size air mattress for extra comfort. Large, oversized windows with mesh covered openings help to keep out the bugs. While it was designed to be pitched in less than a minute, it is still one of the sturdiest tents in the industry. It was made to withstand heavy winds in excess of 55 mph and repels water like no other tent in its class. It features a unique Weather Tec System that includes welded, inverted seams on the floor to help keep the water from seeping in and ruining your sleep. All of the poles and tie downs are pre-attached to speed up the pitching process, and the included stakes help to keep it in place, even in heavy winds (up to 55 mph). The instant tent is made from water and tear resistant 150D Polyester fabric, which provides durability and keeps you dry in the event of inclement weather. Coleman includes some extra touches, like a built-in rainfly that covers the windows during the rain and then can be rolled out of the way to allow for ventilation. There are also inside pockets to keep your stuff off the floor and organized. The Coleman Instant Tent 4 Person is best for the larger family that needs some extra room. It was designed to handle the elements, especially those heavier storms that have a tendency to pop up out of nowhere. It sets up in a matter of moments so that you can use the majority of your time to enjoy the great outdoors. It is sturdy enough, and it will also keep you dry. It is definitely well worth the price. Dome tents are one of the most popular styles of tents. With its high center and rounded top, it provides plenty of room for three people while maintaining a smaller-size footprint. The Core 3 Person Instant Dome Tent is lightweight and durable enough to be used in a wide range of environments. The instant dome tent is made from a sturdy and durable polyester fabric that has been treated with an exclusive H20 Block technology that features water repellant fabric and an active bead technology to provide a high level of water resistance. It comes with a removable rainfly that covers the entire outside of the tent to help keep out the rain during inclement weather, but it can be removed to allow for max ventilation on clear days. The tent is constructed in a way that has all of the fiberglass poles fully attached, and they fold down into a compact package for easy carrying. The tent can be pitched in less than a minute and comes with securing stakes to ensure that it stays in place during strong winds. It can be taken down just as quickly and put back into its carrying sack. The Core 3 Person Instant Tent is perfect for a weekend camping trip, it is compact and can easily be packed in the trunk of the car. It’s unique construction allows for it to be pitched and taken down in under a minute. Its exclusive water blocking technology helps to keep out the rain during inclement weather, but it also has large mesh covered openings to let the air in when it clear. This is the best instant tent for camping for any small family. The Zomake Pop Up Tent is designed to simple to set up or pitch so that you can have more time to enjoy the great outdoors. It is super lightweight and compact so that it can easily be carried around. The poles are flexible, yet strong enough to hold up under normal use. 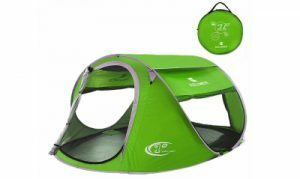 The tent is made from a water and best tear resistant polyester material which makes it perfect for the beach and camping. It’s overall dimensions are 95” x 71” x 39” and it is large enough to hold up to 3 people. The bottom is made of easy to clean and waterproof, 210D Oxford fabric that allows it to be set up on most any type of ground. It comes with a set of stakes that can used to hold the tent in place in case there is bit of wind. There are also two large window openings that zip open/closed with a mesh cover to prevent insects from getting in and allow for great ventilation. There is also two door openings, one at each end for quick access. The Zomake Pop Up Tent is a really highly rated instant pop up tent that is lightweight and compact. It was designed to extremely versatile and used for a wide range of uses like; camping, backpacking and at the beach. Its durability makes it a really good choice for a small family trip to the beach or camping. The instant tent is commonly referred to any that can be pitched and taken back down in a minute or less. This means that you would be free to get started enjoying yourself and great outdoor a whole lot faster. This kind of tent has a number of features that all combine to make it that easy to pitch it. The biggest feature centers around the design of the poles and how they are configured. It was really important that the materials that were used to construct the tent also play a big role in how quickly the tent can be pitched. Everything is designed to be folded down into a compact package and stored in a bag to make it easy to get it to and from your campsite. The highly flexible poles are each attached to the tent and simply snap in place once the tent is unfolded on the spot where you want it to go. Depending on the brand, manufacturer and the methods they use to make it, these instant tents were designed with extra sturdy seams and reinforced fasteners to ensure that they are able to handle quick setup and takedown of the tent. With so many different brands and models of instant tents available on the market to choose from, there are a number of things you should always take into consideration when trying to make the best decision for you and your family. Below are a number of important things that you should always keep in mind when looking for an instant tent. When it comes to deciding on what instant tent is going to be the right one for you and your needs there are a number of things you should always consider; Size, Weight, Material, Setup, Protection, and Price. Size – Since instant tents can be found in a wide range of sizes you need to be sure that you take it into consideration. Whether it is just you and another person who will be sharing the tent and how long you will be living in it. This might mean that you will want to have enough room to move around or just enough fit a couple sleeping bags might do the trick. If you are looking for a tent that is big enough to fit a larger family than you might want to consider a tent that is designed to accommodate more people. There are also tents that have two or more sleeping areas that have zipper closed separator walls for a degree of privacy. If you are worried about the tent taking up too much of the limited campsite space, you should consider looking at one of the dome-style tents, these tents are a lot more compact. The compact size will mean that it won’t take up as much ground when you are pitching it. Weight – The overall weight of the instant tent will depend on a number of different factors including the size of the tent and style of the tent that you choose. So you need to know that more people that you will be needing the tent to accommodate the heavier the tent will ultimately be. This means if you are going to have to hike a distance to your campsite you are going to want to know that a larger instant tent might be more difficult to pack into a backpack. Also, depending on which style of tent you choose either a cabin style or dome style will have a direct impact on the overall weight of the tent. The dome style instant tent will dramatically cut down on the overall weight of the tent as it uses much fewer materials in the construction. In order to cut down on the weight, you could look at choosing a tent that is designed to accommodate a smaller number of people and squeeze into it. Material – The materials that go into constructing the tent will affect a wide range of things when it comes to an instant tent. The types of material used in the fabric of the tent will make a difference in what kinds of environment that it will be best suited for. For instance, if you are planning a trip in early spring or late fall you might want to pick a material that is heavier as it will help keep the chill-out. 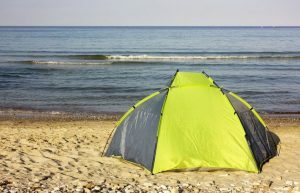 If you are going to be camping during a warming time of the year than you will want a tent that is made out of a much lighter material and that has some larger openings that will allow more air circulation and breezes to come in, while having a good rain fly to keep out the rain would be a definite plus. The flooring material should be sturdy enough to prevent water or debris from penetrating the floor. Setup – How easy that a tent sets up when you arrive at your campsite will mean that you could possibly have more time to enjoy the great outdoors. So when you are deciding on which tent that you are going to buy you will want to pick the one that offers the absolutely quickest and easiest of setup. This is because not all instant tents are made equal and just because it says instant doesn’t mean it will actually be like that when you go pitch it yourself. This is when you might want to consider researching what other people are saying about how easy the brand and model tents actually stack up against others in the same price range. That way you know what you can expect when you get to your campsite and go to set it up for yourself for the very first time. Protection – The primary purpose of any tent is to provide a degree of shelter against the elements. So it is very important that you take into consideration what kinds of elements that you could possibly be subjected to in the area around where you will be using the tent. Most tents offer a number of built in protections from a wide range of elements including; rain, wind, water, temperatures and the sun. While you may not be able to anticipate every single thing that you might encounter while you are camping but to be able to be prepared for any many things as possible could be the difference between an enjoyable experience and one that you would much rather completely forget about. So, it might be a better idea to assume the worst and hope for the best and select a tent that gives you the most amount of overall protections. Price – Knowing what your budget is will make a big difference in what tent you end up with. The price of instant tents these days range from cheap to very expensive and everything in between. While the most well-known brands are generally going to cost the most amount of money, that doesn’t mean that the lower cost brands are not worthy options when it comes to buying an instant tent. You want to be sure that you are getting the best tent for your needs while not exceeding what your budget will allow. While the leading the brands will generally cost quite a bit more than the budget brands, they usually will have many of the same features that you are looking for. So, while price should be a consideration, you want to be sure that you are not sacrificing quality in order to save a little money. It might be a better idea to spend a little bit more on the shelter and cut back on something else in order to be safer. The instant tent concept in camping tents was developed for a number of reasons including ease of setup and taking down and also it folds down into a compact size the makes it easy to transport. Having the flexible poles fully attached makes it very simple to pitch the tent in less than a minute and comes down just as quickly. The instant tent means that you don’t have to set aside hours to get your campsite ready for the night before you can begin enjoying the great outdoors. With a number of different types of tents that are part of the instant tent category. Whether you are needing a tent for just two or one that fits the whole family from 2 up to 12 people. The instant tent was designed with the ease of setup in mind, but that is not the only thing. Depending on the manufacturer, the instant tent was also designed to be used for a wide range of purposes. 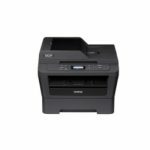 The compact size of the instant means that it can easily be tucked away and carried a backpack for hiking or packed in the trunk of the car for your next camping trip with the whole family.